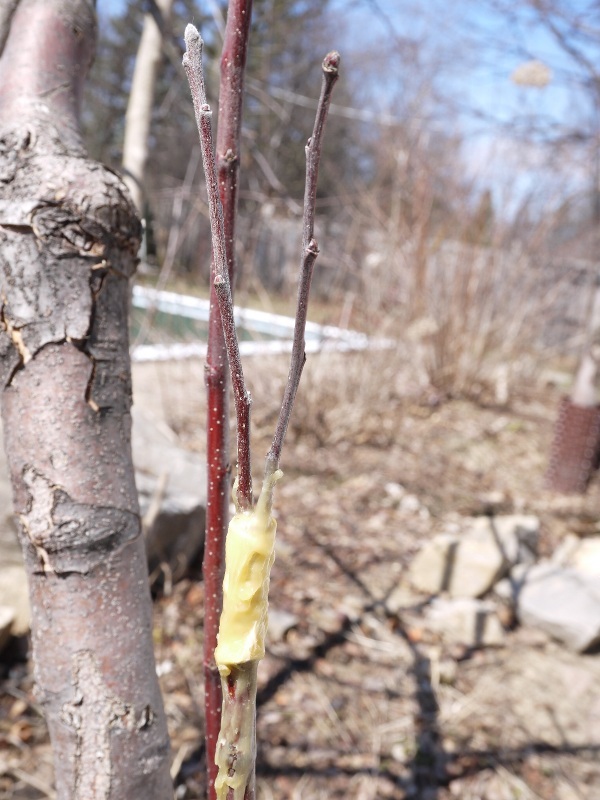 This is the first year I am grafting apple trees. I have one tree that is very old but has excellent apples and I have a younger one which has nice flowers but not so good apples. 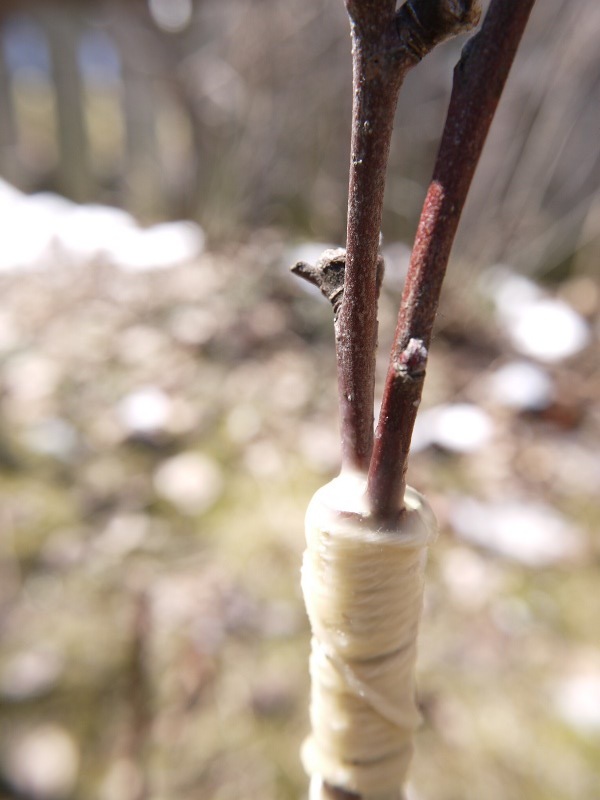 I wanted to graft twigs from the good tree to the not so good one. I used two techniques and you can google those terms if you want to find other resources. Selecting the right twigs from the "good apple tree"
This is supposed to be the easiest technique but it is a bit of fiddling. 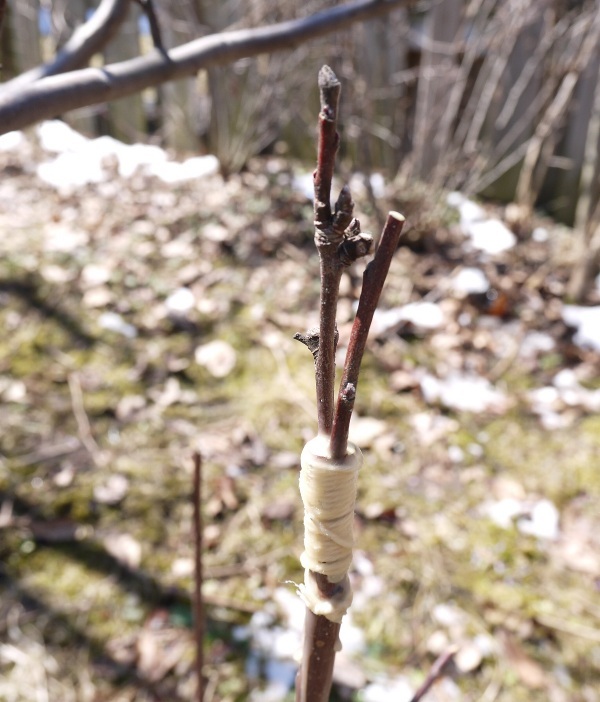 Both the scions (twigs from the good tree) and the root stock (the tree to which you transplant) have to have similar diameters for this method to work well. 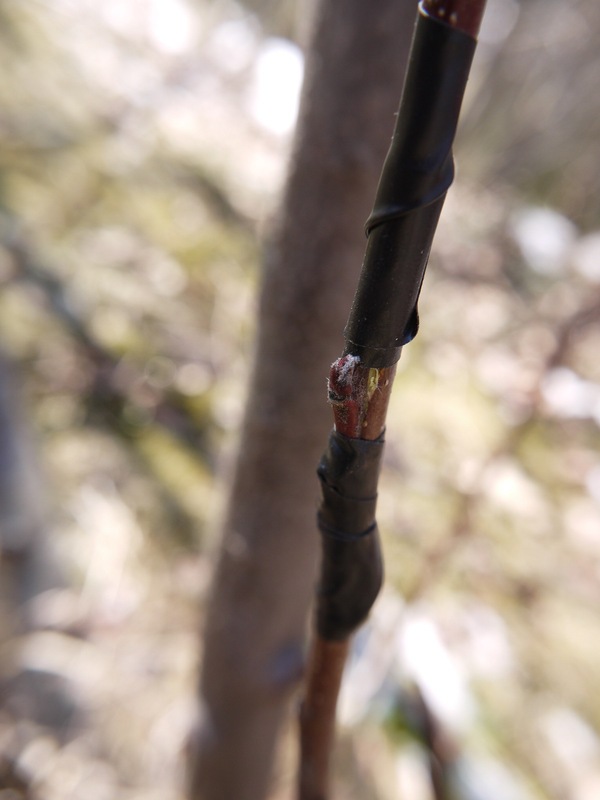 During chip budding the cambium (the soft growing part of the tree located between the wood and bark) between the pice from the good apple tree and the root stock needs to be aligned. Sharp knife. 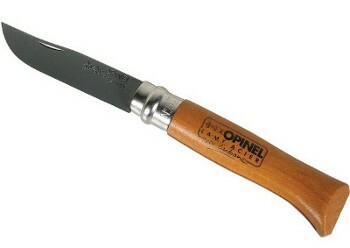 A opinel No.8 or No.9 carbon steel pocket knife works very well. 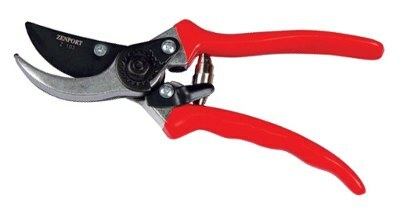 Pruning scissors to cut scions form the good tree. 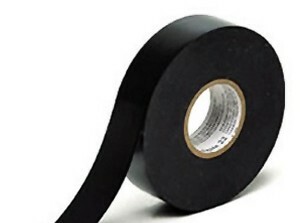 Electrical tape. To hold and protect the chip bud once it has been inserted into the wood stock. Clean the blades of the pruning scissors and the knife with a bit of alcohol before you start and let the blades dry. Cut a single bud together with a bit of wood out of a scion from "the good tree". To do this you make two cuts with the knife as shown in figure 1). First a short cut below the bud and then a long cut from above the bud behind it and down to meet the first cut. Take the bud off (you can hold it with your thumb between thumb and knife blade after the second cut). Put the bud aside but don't touch the fresh cut. Make a similar cut on the wood stock and discard the piece you cut out. Insert the bud into the cut on the root stock. Wrap it with electrical tape but do not cover the actual bud. Wrap it such that the glue side of the tape is outside. That is: no glue touches the bark and you just glue the tape layers to them selfs. Just before start of spring. The very cold nights should be over but there might still be a bit of snow on the ground. The trees should be dry (not a rainy day). 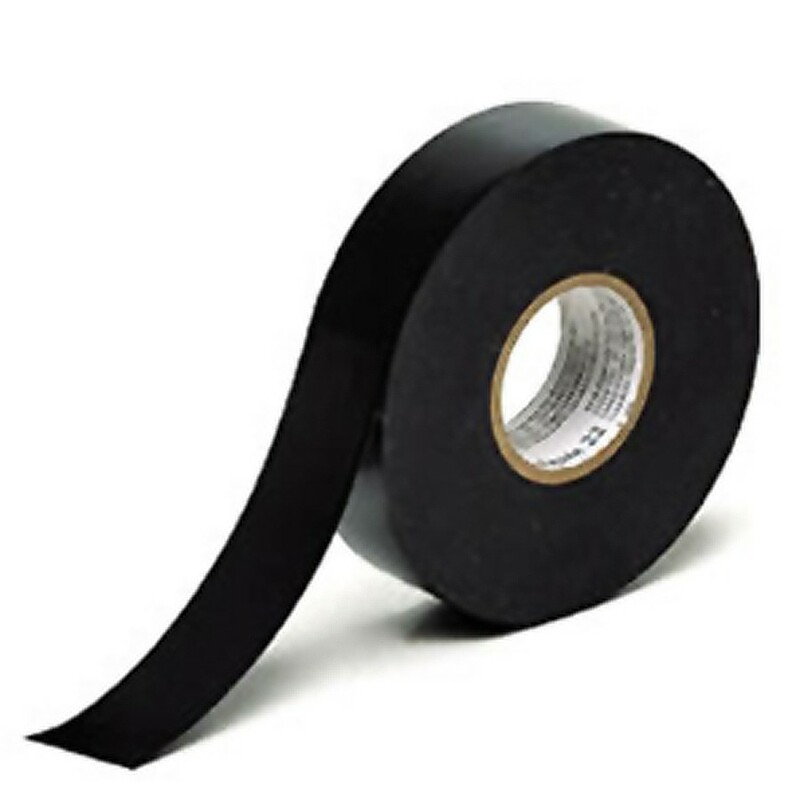 The electrical tape must be removed in summer. I like this method because it allows you to use a bigger branch from the root stock (the tree to which you transplant) and you use two scions (twigs from the good tree). The graft is successful even if only one scion starts to grow properly. The scions are well secured in a v-cut on a branch from the root stock. 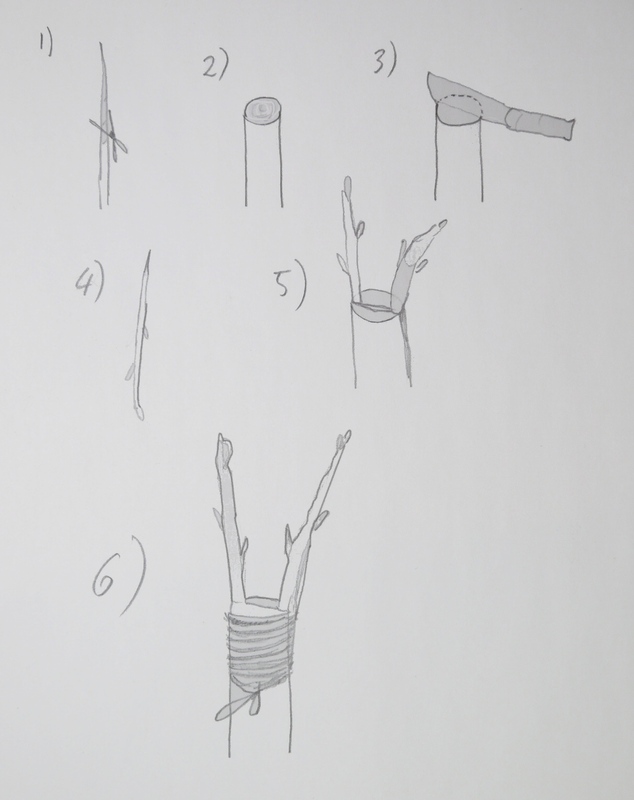 Pruning scissors to cut scions form the good tree and to cut the top off a suitable branch on the root stock. 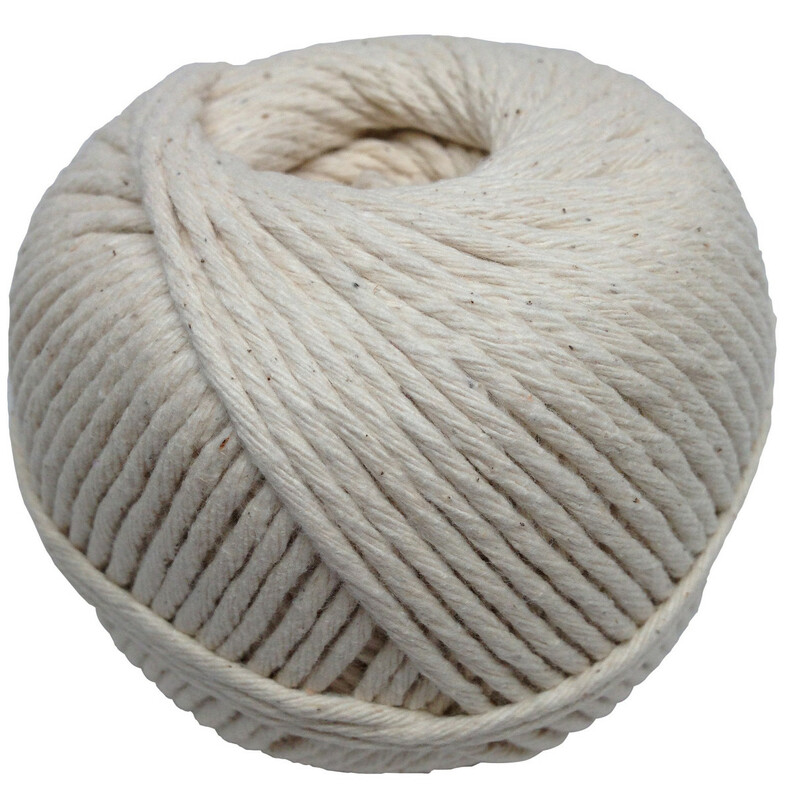 Cotton butcher cord and grafting compound. I made my own compound and I explain below how to make the compound. 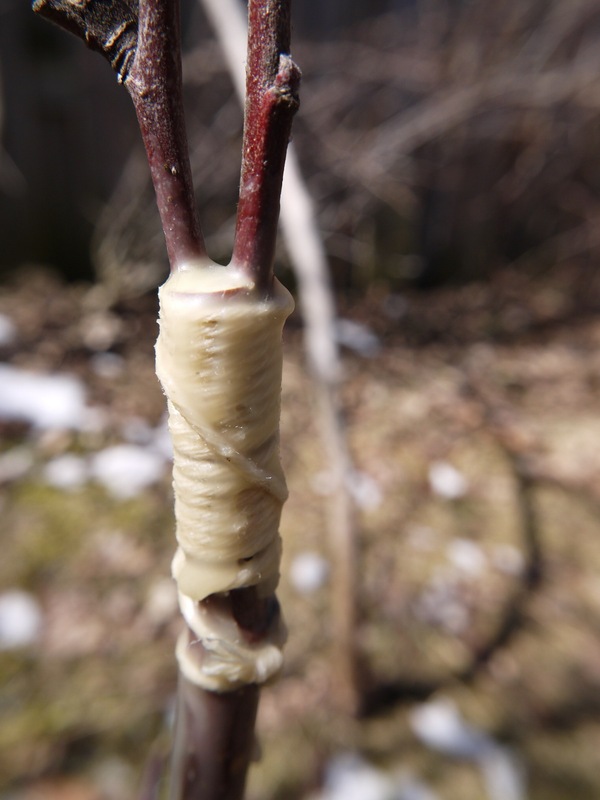 Grafting compound: a mixture of warm bee's wax and oil (see further down). On the root stock you cut off the top of a branch. 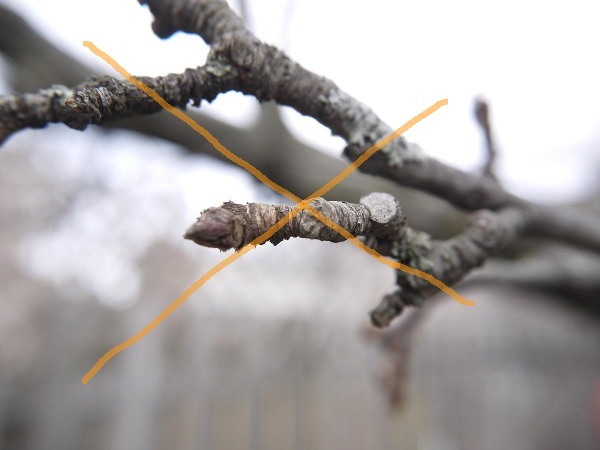 That is: use a branch at least twice as thick as the scions and snip the top off with pruning scissors. 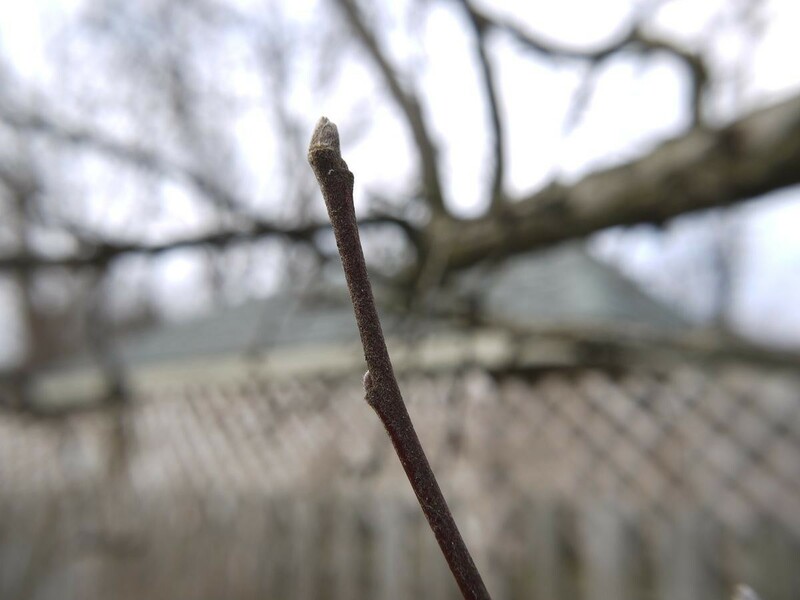 A branch that has about 1cm diameter is perfect. Take the knife and cut from the top down right through the middle (about 2cm deep). We will insert two scions into this v-cut. You don't need to make a real v-cut. One single cut is enough and it will split open when we push the scions in. 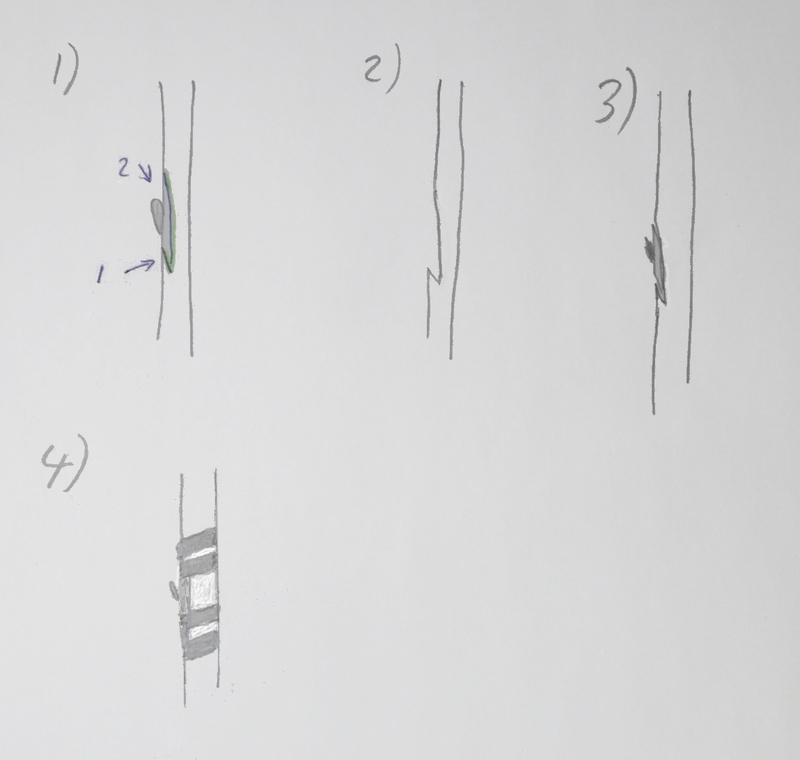 Take a scion and sharpen it into a v-arrow shape. Two clean cuts, one on each side. The v-shape should be as long and flat as possible. Take a second scion and apply the same cut. On the wood stock you pry the v-cut open with the knife blade and you insert one of the "sharpened scion" such that outer bark of the scion and the wood stock align. 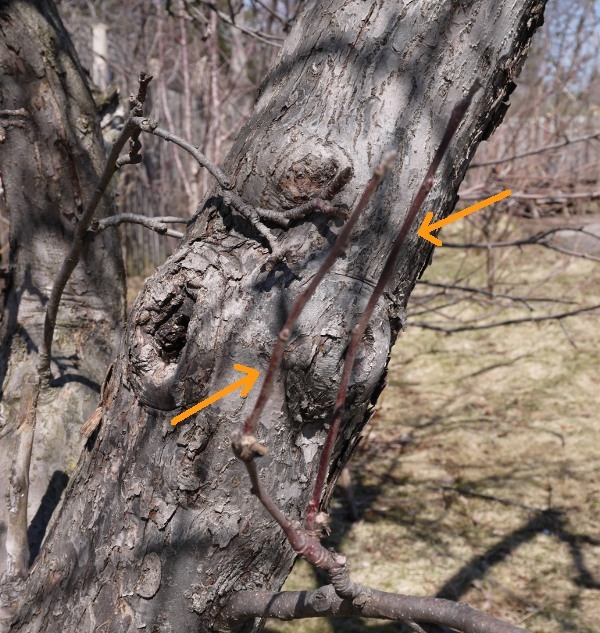 The cambium of the wood stock and the cambium (the soft growing part of the tree located between the wood and bark) of one side of the scion needs to align. Insert the second scion on the other side. 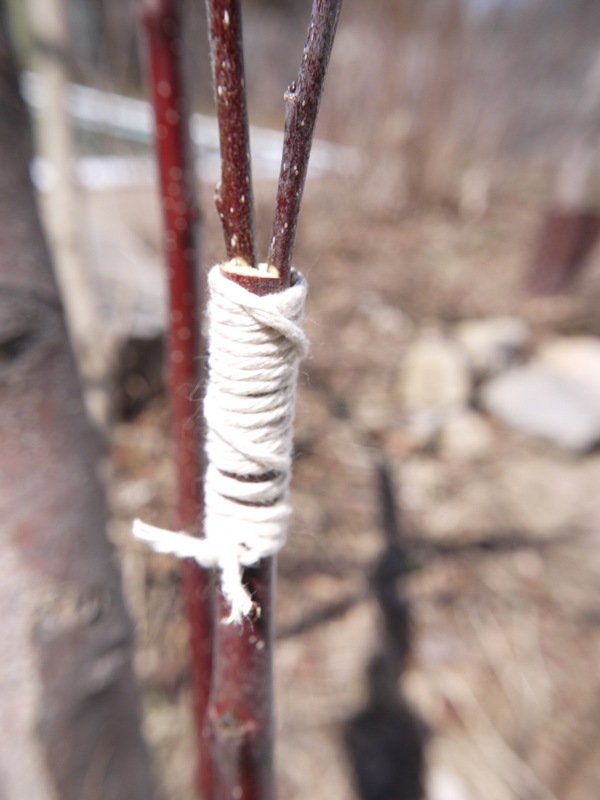 Wrap the grafted area with butcher cord and apply grafting compound as shown below. Don't worry if a bit of compound gets into gap between the branches. You want to seal this to prevent rain water from getting in. 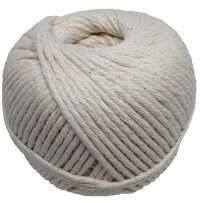 The butcher cord must be removed during the summer. Cut it carefully off with a knife. Melt everything in a small pot on the stove and let it cool down a bit. Apply the warm liquid with a small brush. It should not be too hot. You don't want to cause any burns on the tree. You should just about be able to hold the metal pot in your hands without getting burned yourself. That's the right temperature. 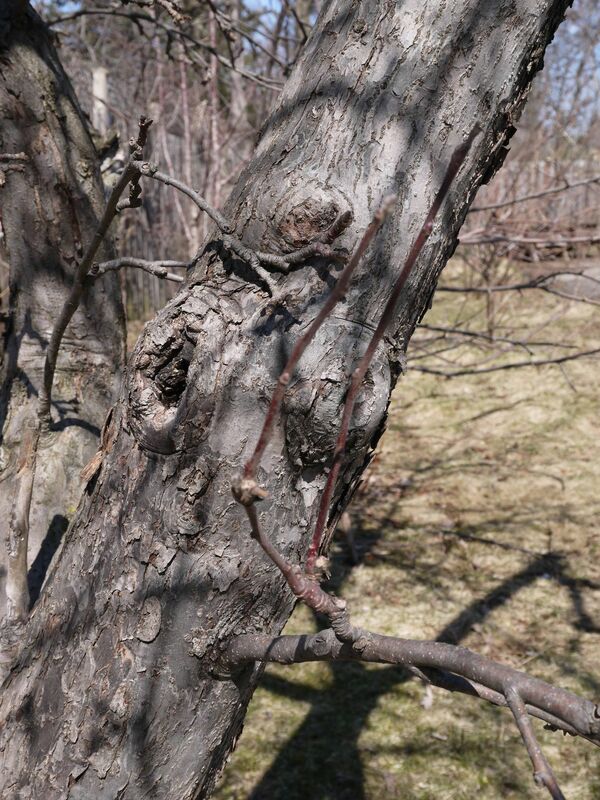 The compound will harden immediately on the tree as the wood is cold (we do the grafting in early spring). 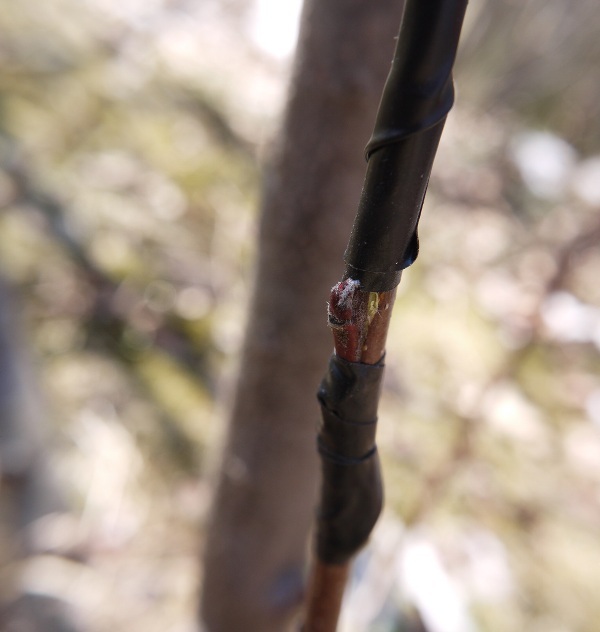 The grafting as described here did fail. The procedure was probably correct but the timing was wrong. 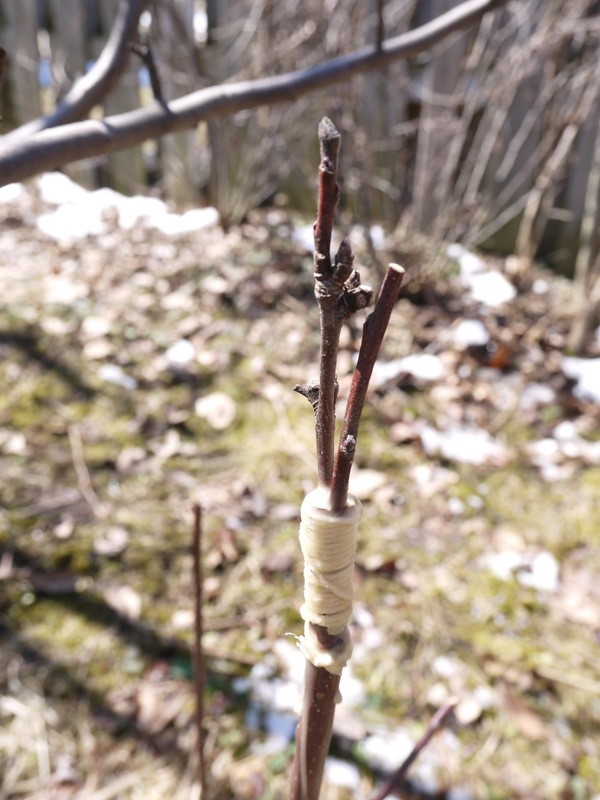 An experienced gardener recommended this to me to have a better success rate: Cut the fresh shoots while there is still a little bit of snow on the ground. Wrap them in slightly wet paper and put them in a plastic bag in the fridge. Wait 4 weeks until spring really starts and temperatures are well above zero during the day and during the night. Get the shoots from the fridge and start grafting. As well: do a number of graftings not just one or two. Do at least 4. It's normal that some fail.